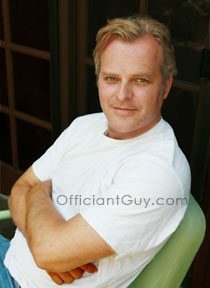 Officiant Guy > What Happens After You Sign Your Marriage License? After your marriage is solemnized by an authorized wedding officiant (an ordained minister, pastor, priest, reverend, judge or justice of the peace) then your officiant must sign and complete the marriage certificate at the bottom of your marriage license. 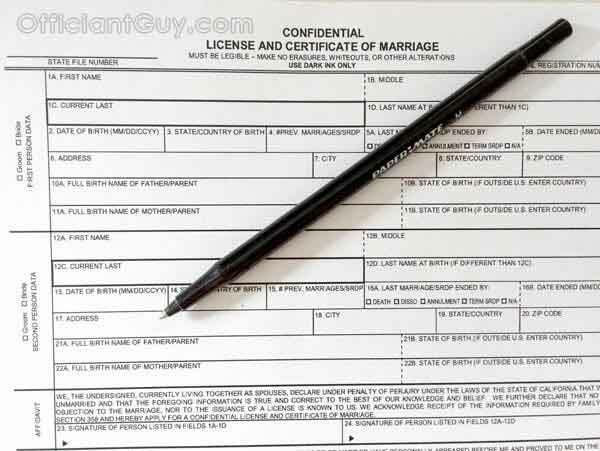 If you purchased a public marriage license, at least one adult witness must also sign the document. If the Officiant Guy is officiating your wedding and providing your California marriage license, he can provide you with a notarized “Customer Copy” of your wedding license right after your wedding ceremony. Your officiant is then responsible for submitting the marriage license to the county of origin within 10 days. 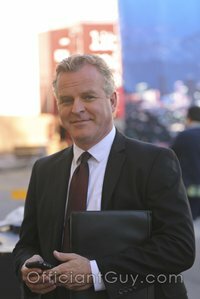 The thing that is unique about Chris, the Officiant Guy, is that he hand delivers your license to the County Clerk’s Office instead of mailing it in. That ensures that it gets there on time, that it is acknowledged by a clerk at the County Clerk’s Office and that it is processed sooner since the County Clerk’s office processes marriage licenses in the order they are received. Any County Clerk’s Office is pretty overloaded and they may take as 6 to 12 weeks to complete the recording process. Don’t panic if you have been married for as long as few months and your marriage is still not yet recorded. It will be the County Clerk is a governmental agency and so they do things at their own pace. Patience is the best method when any dealing with the County Clerk’s Office, That is why we recommend that you ask the Officiant Guy to provide your license. His notarized copy is accepted by insurance companies, financial institutions, most employers, and often the Social Security Administration.. If you failed to order enough certified copies of your marriage license then you’ll need to go in person to the County Clerk’s office and stand in the terribly long ligns or you must download an application for a new certified copies and a Certificate of Identity which you must have notarized before your mail your certified copy request to the County. If you marriage license and certificate was already recorded it will still take several weeks before you receive your new certified copies of your marriage certificate. This wedding officiant recommends that you order three certified copies at the time of your marriage, one for each of you and one for an off-site location, either a safety deposit box or a relative’s house. However, the request for a marriage certificate needs to be notarized which is why we recommend that you order those at the time of your wedding ceremony. It will be much easier to deal with it at the time of your wedding.